"I transformed my body and my confidence has taken a massive boost!" They represent three months, from April to July 2017. 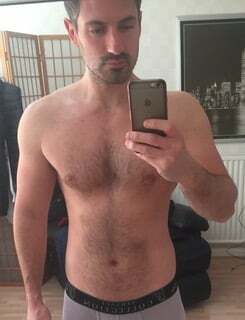 In the before picture I was about 72 kg (159 pounds) but I didn’t measure my body fat, unfortunately! However, in the after pictures I’m about 68 kg (150 pounds) and 10.2% body fat. I started my cut on April 11th and finished around the same time in July. So the cut lasted 3 months, just under 13 weeks. I planned out and stuck to my diet and training religiously. I’d been following the training advice in Bigger Leaner Stronger for a while before cutting, but always neglected my diet… not this time though, I really went for it! I didn’t do anything fancy–I just cut my calories back to a 20% deficit, sometimes 25%, depending on how I felt and had one big cheat meal per week. In the first few weeks of the program my strength and energy levels increased. I put 10 kg on my flat bench press (now at 95 kg), 30 kg on leg press (now at 270kg), and another 10 kg on my seated military press (now at 70kg). After about 5 weeks in I started to get a little tired while lifting, but I stuck with the same weights and only dropped a rep here or there. I’ve been maintaining now for a week or so and my lifts and energy levels have gone back up to what they were before! I followed the 5-day split. It wasn’t exactly like the split from the book, but the principles I followed are the same regarding reps, sets, rest etc. I did chest and triceps on Monday, back and biceps on Tuesday, shoulders and abs on Wednesday, legs on Thursday and a core/ab session on Friday to strengthen my core after my injury. The only cardio I did was playing tennis once or twice a week, which didn’t feel like any extra work because I love playing! I had no hesitations in buying (or recommending) the book at all. As soon as I saw it and read the info on it, I wanted it! When I first started following the training advice a few years ago, I was a bit worried that it was too simple. That by not spending a couple of hours in the gym each day, it wouldn’t be enough to make any gains–that wasn’t the case at all! I got bigger and stronger very quickly, and now just recently I’ve become a lot leaner, too! 🙂 The one thing that stopped me from cutting until this year was the worry that I’d lose a lot of muscle size and get skinny again–something I’d worked very hard to avoid! But I bit the bullet and followed the program and I’m really happy I did! I absolutely love the training advice in the program! The rep ranges and number of sets work perfectly for me. I feel strong when I lift in that way and it’s the only style of training that ever put any real size on my naturally slim frame. As for following the nutrition advice during my cut, it worked like an absolute treat. I was surprised at how much food I could actually eat and still lose so much body fat in such a relatively short space of time. Everything about Bigger Leaner Stronger just works! I’ve been training for over 10 years now and it’s the only style of training and eating where I’ve seen really noticeable changes in my body. It almost doesn’t make sense that I can finish a workout in under 1 hour and see visible improvements week after week. I always used to consider myself a “hard-gainer” and thought I’d always be skinny, but that changed big time when I started following Bigger Leaner Stronger. I’ve always struggled with a lack of confidence with my body and in my life in general. I started my cut to become stronger and leaner, and I can honestly say that my confidence has taken a massive boost because of it. I’m more comfortable talking to people now and I definitely feel better about taking my top off whenever there’s a bit of sun over here (doesn’t happen often in the UK!). Another bonus that has come from my achievements is the sense of “achievement” itself. Transforming my body has been the one and only thing that I can honestly say I’ve been 100% accountable for, responsible for, and in control of. It’s made me realize that with the right guidance, determination, and perseverance, anything can be achieved. I’ve already recommended the program to at least 10 people! But on top of that, I’d recommend it to people who want to change their body but don’t think they can. In particular, I’d recommend it to people who think they can’t gain muscle size, can’t lose weight, or think that fad programs or crash diets are the way to go. It takes a lot of trust to start any kind of training and nutrition program. Trust the person sharing their ideas, trust that the program will actually work, and trust in yourself to stick to it and make it work for you. Yes, PULSE pre-workout. It’s awesome! I’ve tried lots of different pre-workouts and PULSE is the only one that doesn’t make me crash afterwards or feel wired!